The ideal location in northern latitudes is one that provides a full sweep of the sun's rays, good frost drainage, and is preferably close to a large body of water that has a temperature moderating effect. Depending on the design, the orientation of the greenhouse should allow for early morning warming, some mid day shading and late afternoon sun. The pictures to the left shows two different designs and the appropriate orientation for each design. 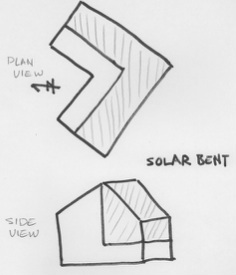 There are benefits and costs to each design in terms of solar gain and heat loss. The arrows in the diagrams point north.